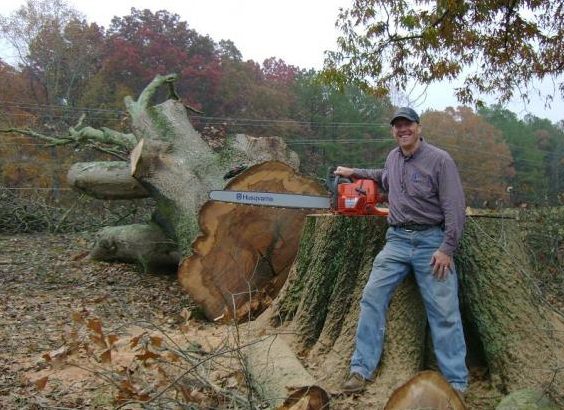 Stump Grinding Done Right in Dunwoody GA With Chipper LLC Tree Service! Over the past 10 years we have obtained many customers, and due to our commitment to quality we have been able to retain many repeat customers. Our commitment to reinvest in our company has grown us to have the manpower, tools, equipment to handle both residential and commercial tree service work. 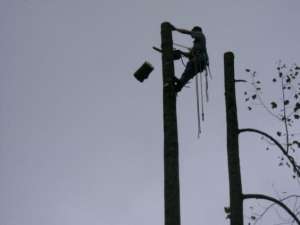 We would love the opportunity to become the company you turn to for your tree service needs! Our goal is to perform your job with minimal impact on your lawn and surrounding landscape. We aren't just tree cutters who subcontract our work, we are a tree service whose job is not complete until the work is done and the mess is gone. We use track-mounted low ground pressure machines and even do jobs by hand when required. 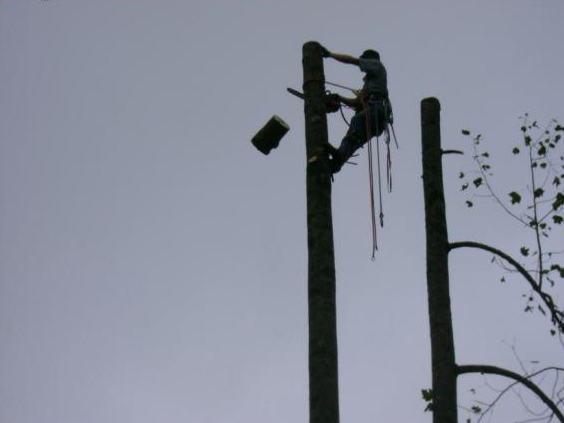 Our estimator will be happy to discuss your tree service job in detail and ensure everything goes smoothly. We are able to offer great prices on stump grinding by utilizing industry-leading equipment like our track-mounted self-propelled stump grinder which will fit through openings as small as 36", but packs enough power to accomplish large jobs quickly. A machine a little bigger than a large lawn mower comes to the stump (ours is mounted on rubber tracks to minimize damage to your lawn). It has a wheel with sharp teeth that grind the stump into fine mulch. Stumps are ground 4-7" below ground level. When we leave the mulch from the stump is raked back into the hole where the stump was and in the place of a stump you have a small bed of mulch. We charge a $75 trip fee to move the machine to the job and then charge per inch in diameter. For exact pricing simply find the widest portion of the stump and measure the distance across. Next call us to give us the number of stumps and diameter and we take care of the rest. Our brush mower attachment is the most cost-effective way to handle large areas overgrown with tall grass, weeds, vines, small trees, briars, kudzu, and other underbrush. 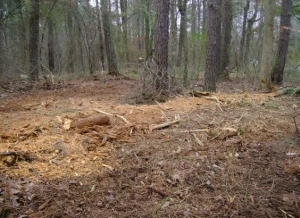 Having operated both brush mowers and forestry mowers, we have found the most cost-effective way to handle an overgrown job is to use a brush mower to remove all debris and saplings under 5" diameter and follow through with traditional tree service equipment like chainsaws, grapple loaders and commercial chippers to remove large trees. Using the correct tools for the job allows us to handle tree removal and land clearing jobs of all sizes quickly, safely and affordably. Cleaning up your lot or mowing the forestry is especially useful when you are trying to sell the property. Many prospective buyers will not even get out of the car if they can't walk the property easily. I (the company owner) have done well in real estate by buying overgrown property that could be cleaned up and subdivided for a profit, so I can definitely speak to the merits of cleaning up your lot to improve resale value. Mobile Screening For Topsoil, Mulch & More! Our mobile trommel screen is available for rent on a daily or weekly basis. Screen rental includes delivery to and from the job, skilled operator and fuel 8 hours on job. With sand, gravel, wood chips, manure, peat, bark or mulch, a screen can be used to remove oversized or undersized particles. For example, our tree service screens our wood chips from our chippers. We use a small screen to produce bark fines which is used for compost and a larger screen to get out the oversize chunks leaving a nice uniform sized product that can be sold rather than being a liability. Additional days without operator - $400. Wood yards can screen your excess bark stockpiles once with a tight screen to remove fines to sell as compost and then again with a larger screen to yield pine bark chips. Landscape supply yards with on-site stockpiles of common dirt or fill can affordably convert a low dollar product into a premium product and add another product to their line up. On large cleanup sites, screens can be used to separate trash or wood products from dirt. On-site screening can eliminate hauling loads of heavy dirt to a landfill by pickups screening the trash out of the dirt. We are strictly a concrete demolition subcontractor - we don't pour concrete. With that being said, we will demo and dispose of most residential concrete jobs that are local and over 1000 sq. feet. Our price for this service is only $1.25 per square foot. If you like to DIY, we also own an equipment rental yard and rent our Skid Steer mounted Concrete Jackhammer Attachment for $150 per day (24hrs) or $100 per 1/2 day (4hrs) if you have your own skid steer. We can rent skid steers starting at $275/day for mid-size track skid steers. If you're considering stump grinding for your Dunwoody GA home, don't hesitate to Contact us today to get your FREE estimate! For over 10 years we have been in business, and don't plan on stopping any time soon! We'd love to change your property into something beautiful!